You can't help but smile when you see Ann Kelle designs! 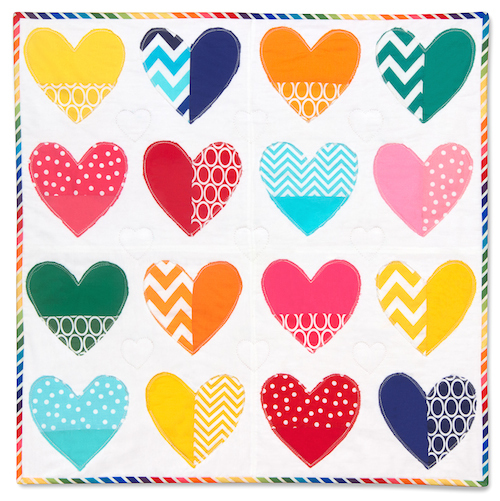 They are always so bright and cheerful, whether it is fun geometrics in Remix or friendly animals in Urban Zoologie or all the kids in Girl Friends. Ann Kelle's happy colors are now available in Aurifil thread boxes, all carefully coordinated to match her fabric collections. Available in both the large box, including 12 spools (1,422 yds each) of Aurifil 50wt. cotton thread, and the small box, including 10 spools (220 yds. each) of 50 wt. thread. So much happiness in one box! But the team at Aurifil doesn't want to just show you the colors, they want to give them to you. And we want to give you some fabrics to try it out with! Would you like to win your very own box of Ann Kelle threads from Aurifil PLUS a stack of Remix fat eighths? Here's your chance, by entering the Rafflecopter giveaway below. Entries accepted until Monday, June 16. Winner will be announced on Tuesday, June 17.